SR1 MORRISH COASTAL PROTECT/RES AUTH - Approves the annual integrated coastal protection plan for Fiscal Year 2018. SCR1 MORRISH COASTAL PROTECT/RES AUTH - Approves the comprehensive master plan for integrated coastal protection. 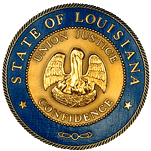 SCR2 LAMBERT WATER/WATERWAYS - Approves the Atchafalaya Basin Annual Plan for Fiscal Year 2017-2018, as adopted by the Atchafalaya Basin Research and Promotion Board and the Coastal Protection and Restoration Authority. SCR67 ALLAIN CONGRESS - Memorializes Congress to pass legislation or adopt policies allowing Louisiana to manage the Gulf of Mexico red snapper fishery out to two hundred nautical miles off the coast of Louisiana.